For us as Catholics, the new liturgical year started with advent and the preparations for Jesus’ arrival. God sent His only son in human form to earth and did this knowing that we would eventually persecute and crucify Him. Jesus’ willingly sacrificed Himself for us knowing how His life here on earth would end. As if this wasn’t hard enough, Jesus faced many hardships throughout his life. He was born in a stable after his parents were rejected at the Inn. Not long after Jesus was born, the family had to flee to Egypt to avoid Herod’s paranoia and massacre of innocent children. During his ministry, Jesus was criticized by the religious leaders of the day, the scribes and Pharisees and was ultimately betrayed by one of his followers. What relevance does this have for our world today? Are not people rejected by others and made to feel not to belong? Are not people persecuted and have to flee their countries of birth? Are not people criticized and ridiculed by the “in crowd”? Are not people betrayed by their friends? With the advent of social media, it has become so much easier to criticize and reject others. How do we combat our human condition? We follow the example of God and Jesus: with Love. God wants us to be His hands and feet today on earth and treat one another with Love. According to Pope Francis, our mission is to obey God and give Joy to others: “Love and joy are gifts we must ask the Lord for.” We spread Joy when we express gratitude for the blessings that God has given to us. We spread Love when do things for others without expecting something in return. For this calendar year, take a moment each day to spread some Love and/or Joy. This is a huge task and we will not always be successful but it is a goal to strive towards each and every day. 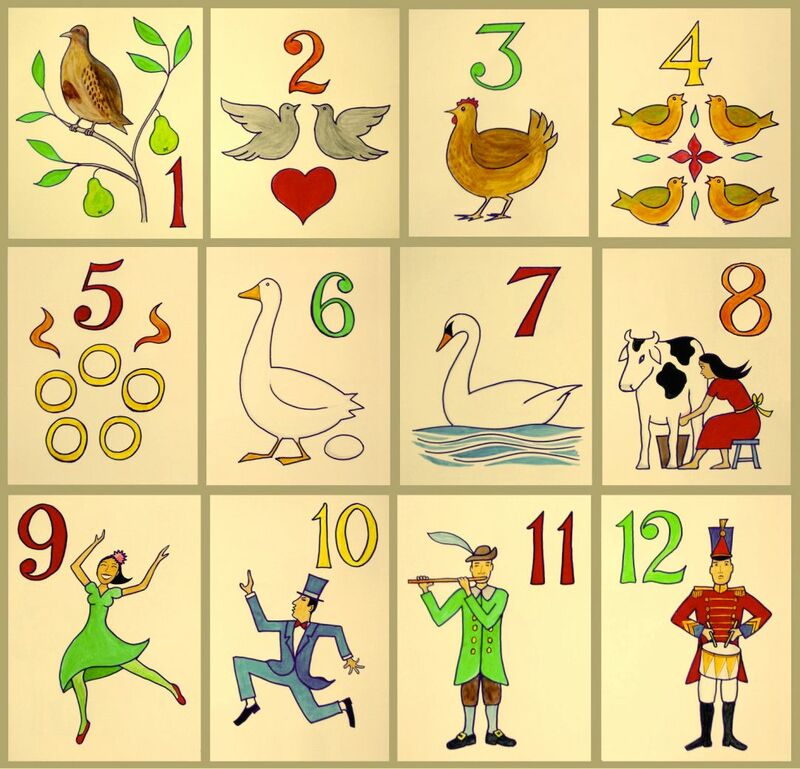 Did you know that the popular Christmas song, the Twelve Days of Christmas was written in England in the 1700s? It has been suggested that the song was used a method for Catholics to learn the teachings of the faith when, during this time in England, Catholics were persecuted for their faith. The three French hens are a way to remember the Theological Virtues of Faith, Hope, and Charity. During November and December, we have been focusing on our Van Tighem Virtue of Accepting: I accept that everyone is unique and made in the image and likeness of God. It is also tied to the Catholic virtue of Fortitude which helps to strengthen our resolve and to overcome difficulties. Students believe that being accepting means that we should celebrate that God made us different. We can demonstrate it by including others, welcoming new students, concentrating on what makes someone unique and special, appreciating everyone’s contributions, accepting people for who they are, welcoming everyone to our school, and allowing everyone to join in. We should embrace, welcome, and encourage other people’s differences. After all, we are all a box of crayons! Students also came up with some excellent examples that follow as to how they can be accepting in the classroom. Accept others into your groups. Be kind and inclusive when working in a group. Make conversation with others. Be open to different work environments and help to create them. Celebrate other classmates’ learning abilities and styles. Sit with everyone. Accept and listen to other people’s answers, ideas, and opinions. Help people out if they are having trouble. Invite others to be your partner. Pick different partners or groups when you have the chance. In the hallway, a strong theme of patience and caring for younger students came across. Be patient walking the crowded hallways. Wait for students who are walking slower than you. Make conversations with different people. Walk with someone who may be alone. Invite others to join you. Visit quietly with others. Be considerate of the shared hallway spaces. Wait patiently for the student in the locker above or below yours to finish or ask politely to use your locker. Be aware that all students are going different ways, places, and speeds. In the gym, inclusion and encouragement were important to different classes of all ages. Students demonstrate acceptance by including others, inviting others to join, and accepting anyone who wants to play. Students also thought that they need to recognize everyone’s talents, accept players of all skill levels, invite everyone to participate, encourage team members as well as opposing team members, and make encouraging and positive comments as a spectator. While playing outside, students should be open to play a game someone else’s way or by someone else’s rules. Realize that there are many different ways to play games. Try to get everyone involved in a game. Ask people to join your game. Try new games that others want to play. Compromise on game choice. Invite others to join you when going off campus. Giving compliments to people is a way to help them to feel more accepted into a group. As we are constantly striving to improve the quality of education at FLVT School, our Van Tighem Virtues are a goal in our Continuous Improvement Plan. We are continually working towards teaching the attitudes and behaviour students need to be successful in life. The work we have done on Honest and Accepting is available on our constantly evolving website page. Please find it on our website under Our School/Van Tighem Virtues. The Van Tighem Virtues are a guide for the adults and students as to how we treat each other: fairly and with respect. Once completed, they will serve as school rules so that students will know how to act and what we expect of them academically, socially, and spiritually. By the end of the year, the rules of the school will be clearly articulated so all staff and students will have a better understanding of the ways we can demonstrate our Virtues. Our focus for January and February will shift to Wise: I speak up for myself and others even when it may not be popular (Tied to Justice). Wise Up is our video and we have chosen the following lyrics as a focus: “Wise Up. I’m gonna listen and do. Wise Up. Every day I will chose to.” Students will be challenged in January and February to think about what they are going to choose to listen and do to demonstrate being Wise. How are they going to speak up for themselves and others, even when it may not be popular? I look forward to seeing what the students come up with. During Advent and all the preparations for Christmas we generally hear many Christmas carols being sung. One popular song is the Twelve Days of Christmas. Every year on the radio I hear how much it would cost to purchase all the gifts mentioned in the songs. As great as a partridge in a pear tree is or twelve drummers drumming are they don’t reflect the true meaning of the song. First of all, The Twelve Days of Christmas are not in the Advent season leading up to Christmas but are the Church’s celebration of the Christmas season starting with Christmas Day on December 25 and ending twelve days later with the celebration of Epiphany on January 6. I did some research on the song and found out that it was written in England during the time when they changed to the Church of England and Catholics were persecuted. During the 16th and 17th centuries it was a crime to be a Catholic. The song was written as a method for Catholics to secretly learn the teachings of the faith. The “true love” in the song who is giving the gifts is God while the “me” receiving the gifts are every baptized person. As we leave Christmas season and move back into ordinary time, make a resolution that is not so ordinary. Take time every single day to give thanks for the gifts that God has given us. A good place to start might be with the Twelve Days of Christmas.